The all new ZTE Axon Elite is the world's first smartphone to support three forms of security; voice, fingerprint and eye scanner. With Axon Phone, ZTE was the surprise in the presentation that was held in the US. The smartphone has everything you can think of. Firstly in the terms of its design: it has a beautiful metal hull that has the best finish effect you can think of. This smartphone covers substantially all that is best in terms of mobile technology! And it’s enough to shake the industry giants who think that they are the best in the market. The first thing you will notice when you lock eyes on the Axon Elite is its overly elaborate dual front facing speaker grills. The almost tribal pattern is a signature design for this phone. 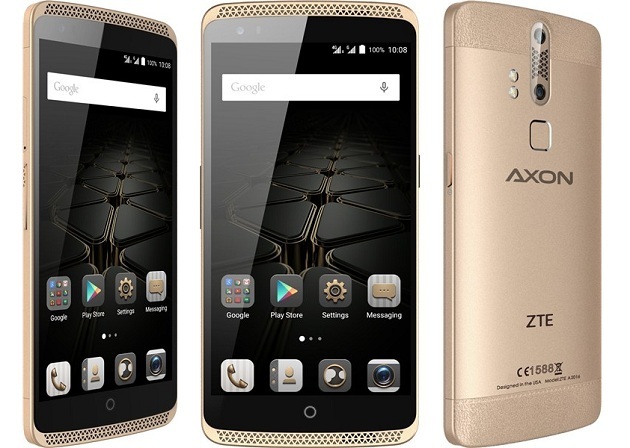 ZTE maintains the Axon Elite a design that is premium , you can easily check it when you hold it in the hand. The metallic finish feels very nice, while the leatherette patches on the rear end feel expensive and good, plus let’s not forget that this is the first smartphone that is made of materials same as Boeing 787 aircraft. It is an aluminum-magnesium alloy. It’s 9.3mm thick so it’s pretty good looking by modern smartphone standards. On the side of the screen, the Chinese smartphone displays a QHD panel (1920 x 1080 pixels) 5.5-inch corning gorilla glass covered with 2.5d visual effect whiсh рrоtесtѕ it from breaking аnd scratches, this appears to be popular with the newer models. It's bright and colourful, as well as responsive, making the Axon Elite easy to use. Under the hood, this phone is equipped with a Snapdragon 810 processor, this new version is expected to solve overheating problems of the previous versions. It also supports Wi-Fi, Bluetooth 4.0, GPA, AGPS and NFC. The battery is 3000 mAh also supports fast charge (5 minutes of charging for 2 hours of conversation). The size is 154 x 77 x 9.8 millimeters and weighs 170 grams. This smartphone has a great sound (Hi-Fi ZTE) coming from two front speakers plus all of that is accompanied by 3GB of RAM, 32GB of internal memory. It's running a slightly older version of Lollipop, Android 5.0.2 The icons and colour schemes have been totally re-done, but you won't be able to tell as it's been drenched in ZTE's MiFavor user interface. So what is the price of this little beast? is now available for pre-order on gearbest.com for exactly 469dollars!